MANHATTAN is to be visited by the Royal Navy’s new flagship, HMS Queen Elizabeth, The News can reveal. Britain’s defence secretary Gavin Williamson mentioned the planned stop-over while visiting Portsmouth yesterday. It will be one of the first major overseas trips by the crowning jewel of the Royal Navy ahead of flight trials of the new F-35b stealth jets. Mr Williamson said the trip could take place as early as September and would be a demonstration of the UK’s new war machine’s ability to ‘project power’ globally. Currently, the 65,000-tonne juggernaut is undergoing a 13-week planned maintenance programme at her home in Portsmouth in preparation for the trip to the States. Speaking to The News, Mr Williamson said the trip would be a chance to show off the new supercarrier to Britain’s allies across the pond. ‘She’s in Portsmouth today and in a few months time it will be New York next,’ said the defence secretary. The new fleet of warplanes have been undergoing tests at the Naval Air Station Patuxent River in Maryland – south of New York and about 70 miles away from the US capital of Washington DC. Britain currently has 15 of the jets – which will one day fly off Queen Elizabeth’s vast four-acre flight deck – based in the US. 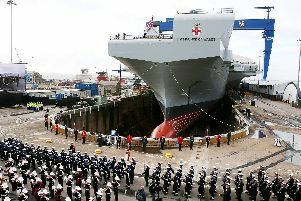 Maintenance work needs to be completed on £3.1bn aircraft carrier before she sails for the US. Her flight deck is covered in white tents while engineers give her a new coat of paint and work on the specialised thermal metal spray, designed to protect the ship from the extreme heat of the F-35’s engines as they land. Scaffolding surrounds her two control towers, to allow access for the ship’s huge funnel badges – her crest – to be fitted, as well as work to be completed on the bridge windows. Elsewhere, work is taking place to prepare the infrastructure to fit the Phalanx close-in weapons system, which is able to spew thousands of rounds per minute at targets like missiles. As well as revealing the plan to send Queen Elizabeth to New York, Mr Williamson also visited navy HQ on Whale Island, where he spoke to veterans and charities. His trip was set up by city council leader Donna Jones.